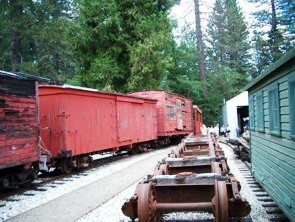 After arriving at Portola from the Feather River Canyon, we toured the amazing museum/shop of the Feather River Rail Society. 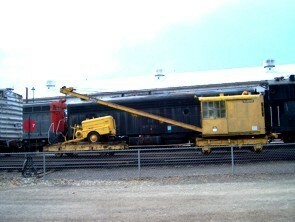 This facility does restoration and rental of vintage diesels and streamliner passenger cars and has a storage area for unrestored freight equipment. 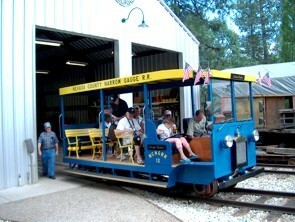 Those who could see the controls got to run a diesel back and forth - pretty cool! 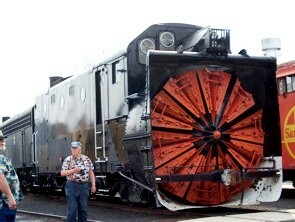 Snow plows were a necessity in these mountains - a rotary and a wedge were in good repair. 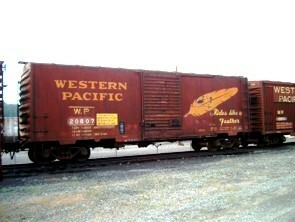 Lots of train watching at Keddie on ex-WP mainline (now UP and BNSF). 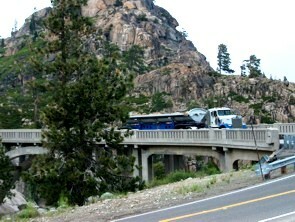 The Donner Pass has quite a reputation as a result of its super-deep snows, as well as the fabulous tales of hardship, cannibalism, and death in the winter of 1846. 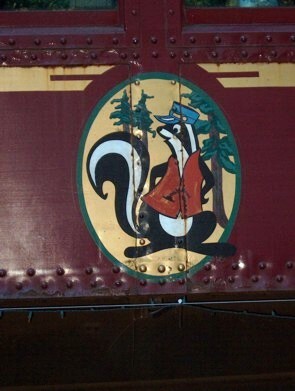 In 1952, the crack SP passenger train, "The City of San Francisco", was trapped for several days when 13 feet of snow piled up in Donner Pass. 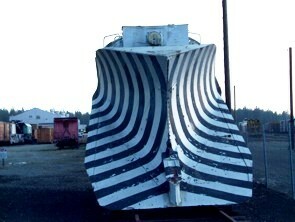 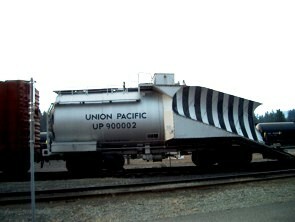 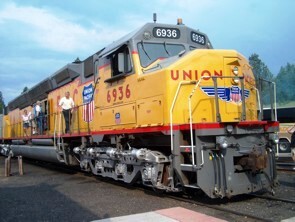 Rotary plows and a hardy work crew rescued 286 passengers and crew, unharmed by the ordeal. 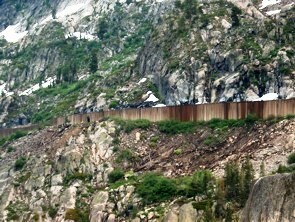 The SP snowsheds are still visible on the mountainside. 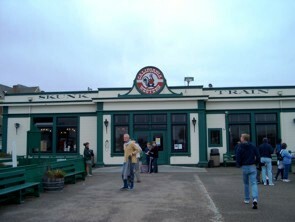 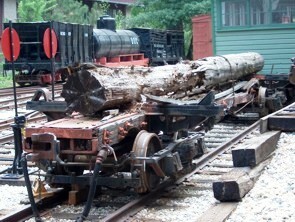 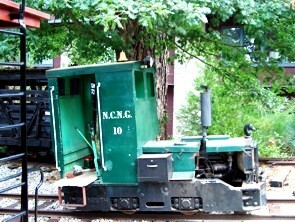 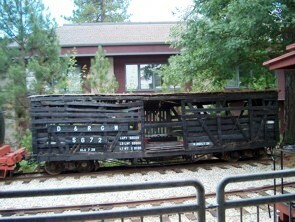 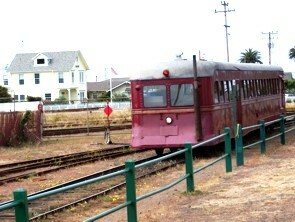 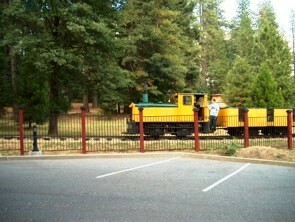 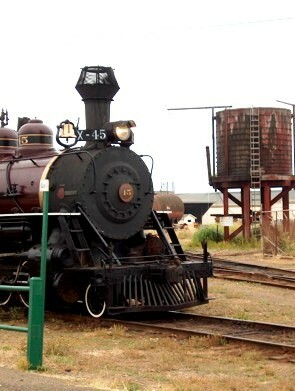 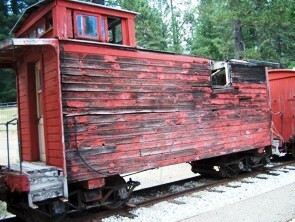 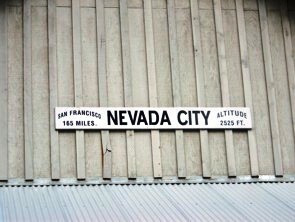 The Nevada County Traction Company is a 2 foot gauge line that links the Museum to the nearby Northern Queen Inn. 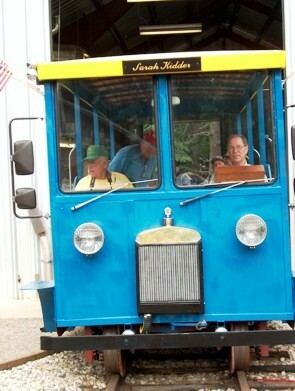 A little yellow and green mine diesel pulling converted ore cars runs us downhill through a switchback to a very scenic setting for dinner, a streetcar suspended over Gold Run creek and waterfall - The Trolley Junction Restaurant. 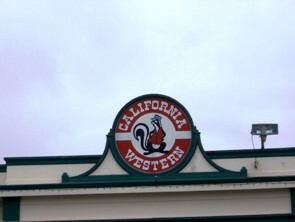 Back near the coast, we return to Redwood country and onboard the California Western railbus, better known as the "Skunk Train" because of the terrible smell from early gasoline engines. 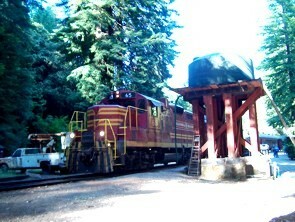 We run from Willits to Northspur for a BBQ supper in the heart of the redwoods. 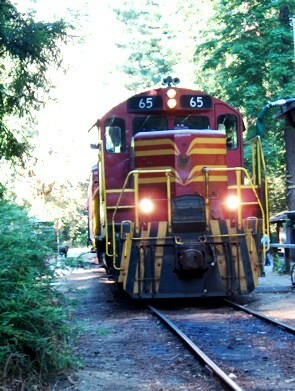 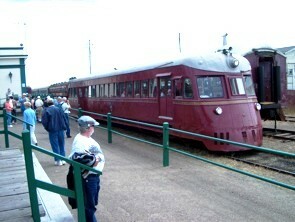 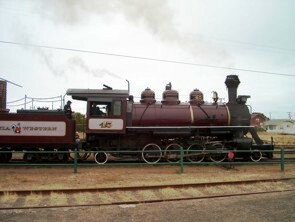 The diesel train also makes the same trip with a slightly larger passenger load. 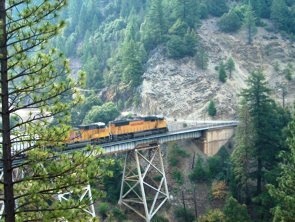 The Northspur to Fort Bragg leg of the run was closed due to weakened bridge, so we ended up back at Willits and bused to Fort Bragg. 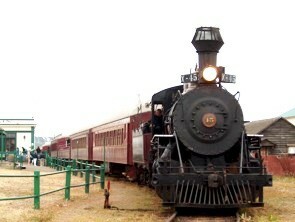 The Western California steam train was not part of the tour but we watched it set out next morning.